As part of the AHRC-Connected Histories of the BBC, Saturday 1st December 2018 saw the launch of the fifth in the series of BBC websites, 100 Voices that Made the BBC. Pioneering Women is published to coincide with the centenary of women’s suffrage in the UK, and explores the contribution that women have made to shaping close to 100 years of British broadcasting. The website includes a large number of clips from programmes which have not been seen or heard since they were first broadcast several decades ago. There are also numerous extracts from interviews, as well as photographs and written documents that are being made publicly available for the very first time. The BBC World Service is launching a new weekly programme with an all-female line up. The Conversation starts on Monday 27 October (2030 GMT). Each week the programme will explore the success stories of two women from around the world who work in similar fields, through a conversation hosted by the BBC’s Kim Chakanetsa. While the fields of experience have expanded substantially, this kind of programming has a genealogy that stretches back at least to the 1930s. Lilian van der Goot, who co-founded the International Association of Women in Radio and Television, (and herself ran a long-running programme called “Een kort gesprek van vrouw tot vrouw” [A short chat from woman to woman] on the Dutch AVRO) claimed to have been inspired by such programming – on the BBC overseas service. She specifically mentioned Olive Shapley’s “Miner’s Wives,” in which miner’s wives from France and Britain found common ground in their shared experiences. Will be very curious to hear the new show! Whilst looking online for images of radio and women (partially because I was reminded of such images by a photo of a more recent Katharine), I came across this lovely one of suffragist Kate Frye on the blog of the women’s suffrage historian Elizabeth Crawford, who has also published Kate’s diary leading up to suffrage in 1918. (The whole blog is well worth reading!) As Ms Crawford notes, Kate was an avid radio listener – as attested to by the photo here, where the radio headphones hang casually over the headboard. It is not only unusual to see a photo of a woman in her bedroom from this era, but I also have to say this is the first image I have seen of radio outside of a sitting room. Elizabeth Crawford is currently developing a documentary for ITV based on Kate Frye’s life (and diary) and it will be great to see what remnants of radio listening might appear. Working my way through Kate Frye’s extensive collection of photographs I have just come across this one. 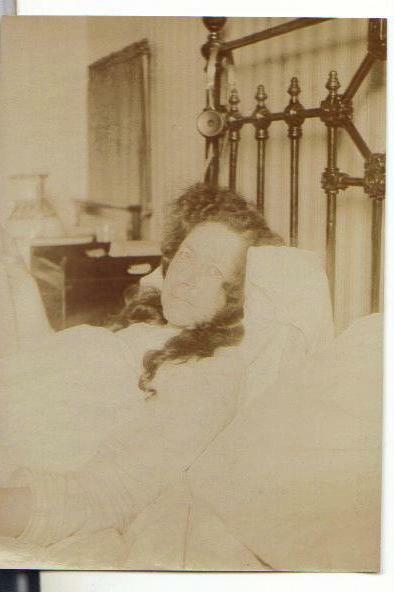 It is so unusual to see a photo of a woman lying in bed that I thought I must share it with you all. You’ll note the radio headphones hooked on the brass bedstead which probably dates the photo to the second half of the 1920s. The photo would have been taken by Kate’s husband, John Collins, who was a keen photographer. Kate, for her part, was a keen and early radio listener, delighting as she did in all forms of music and drama. In 1992, over 200 women made history in Bristol by setting up the UK’s first women’s radio station – Fem FM. Bristol Record Office has digitised the original broadcast tapes, now available for research as part of the Fem FM archive of recordings, photographs and other material. On International Women’s Day, M Shed will mark the launch of the archive by hosting a panel discussion about women’s achievements in radio over the past two decades. Is the climate better for women broadcasters in 2014? Also see WREN’s resource page for this and other research resources. UNESCO gathered the first world statistics on women in broadcasting in 1958, when they contracted the International Association of Women in Radio and Television to conduct a survey. Documents relating to this are in the UNESCO archives in Paris. The CBC’s online archive has put online three of the eight still existing shows by Kate Aitken, longtime voice of women’s programmes in Canada. One of these in particular is interesting from WREN’s point of view – the show from March 31, 1950, where “Mrs. A.” visits Paris, talking about everything from city planning and education to fashion. She also answers listener’s mail in a very personable fashion, with her trademark (and to present-day ears striking) singson delivery. It also shows the combination of public service and commercial concerns that worked through women’s programmes. (Aitken’s stationery in the 1950s billed her as ‘the broadcaster for Good Luck Margarine’). Kate Aitken, besides being a fixture in women’s programming in Canada, was also an active member in the early years of the International Association of Women in Radio and Television, although this particular broadcast comes from before she joined the group. As can also be seen in Kristin’s Skoog’s post about online materials in Sweden, features about life, and in particular women’s lives, in other countries appeared frequently in women’s programmes in the postwar era.